Im surprised this recipe does not have more reviews... these are delicious! I followed the recipe exactly as written and my wings were crispy outside, juicy inside, and flavored perfectly. 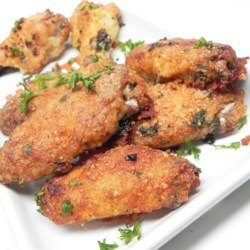 Seriously, if you are looking to make some addictive and crave-worthy wings, look no further- the recipe is right here!